of course I bought the book! This entry was posted in Trump and tagged Trump on January 5, 2018 by Silver Willow. 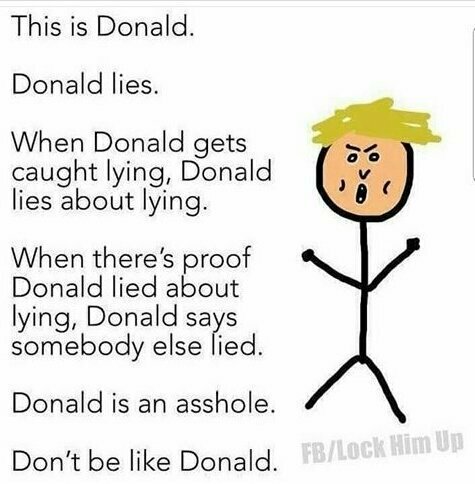 Fortunately there are not too many Donalds in the world. Can't wait to hear your book report/s! I won't lie, I would try to read it given the choice and knowing it does say it may not be gospel. I know, huh? I feel kinda/sorta little bad about joking about someone who could incinerate us all, but if I don't, my blood pressure goes too high and my UC acts up. Need a little comic relief now and then, right? We do need to laugh. Colbert helps me keep my sanity. Enjoy the book and give us the highlights. I probably won't buy it — but you can bet I'll be checking it out at the library! haven't you heard? Donald says he's 'a very stable genius'. I feel much better now. Sue dud too — the audio format. Awesome – I look forward to your reviews of this stable genius.